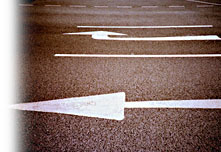 Municipal Street Sweeping – over 100,000 miles of streets swept each year. We sweep entire cities ranging in size from 8,000 to 200,000 in population, we remove tons of debris from streets that otherwise would pollute our streams and oceans. Parking Lot Sweeping – Shopping Centers and Retail Sites, Office and Industrial Parks, Condominiums and Apartments. Sweeping enhances the life of your asphalt, improves property appearance/image, Go Green…Keep Your Pavement Clean! Construction Sweeping – Construction sites, dirt hauling, housing developments – dust control compliance – asphalt preparation for sealing and striping. 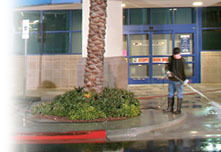 Pressure Washing – Sidewalks (gum, dirt and stain removal), trash enclosures, bus stops, graffiti removal. Contact us for an estimate or more information. © Venco Power Sweeping, Inc.